Created in 1872, the canvas once again confirms the artist’s love for nature and especially for the forest. He portrayed him at noon, in clear weather, where light plays in the leaves. But there is another version of the forest thicket: full of darkness and unknown. Such a vision can cause the viewer to thrill or even fear the unknown. 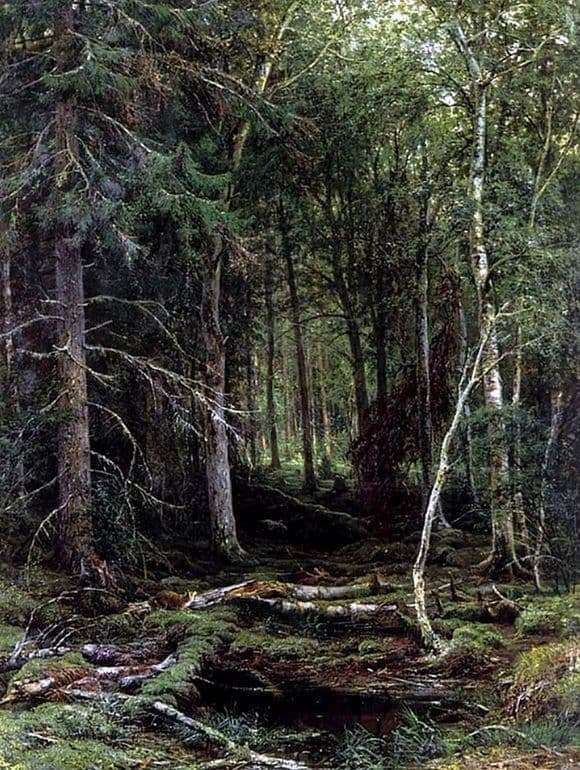 It is these feelings that Shishkin awakens with his canvas “Forest Wilderness”. It is the sensuality of the picture that brought the master the title of professor, right after she finished working on it. Looking at the forest thicket, few people wish to be in such a place, and even alone. But not immediately the viewer manages to see a full-fledged forest in the depicted landscape. The artist conceived a picture for a long review by the viewer. He should feel what he saw, get used to it, that look deeper. The picture is full of small details that can elude a passing glance. Here and fox and duck, which escapes from the clutches of sly predator. For such a detailing of the artist, his comrades in the brush were repeatedly scolded, calling the picture a painted picture, and the details were piece-inscribed into the overall image. But never before has the detail of the image affected the integrity of the image being created. The depicted forest does not cause impulses of inspiration or lyrical reflections, but still it appears to the audience amazingly rich in its colors and its various details. These details beckon for a long time and carefully look at the treasures that the forest hides in the shadow of the branches. Then the spectator, absorbed in secrets, dissolves unnoticed by himself and only nature remains around. So Shishkin created this landscape as the embodiment of his spiritual impulses, as a reflection of his own view on the infinitely beautiful elements of nature: a dense northern forest, untouched by human hand.